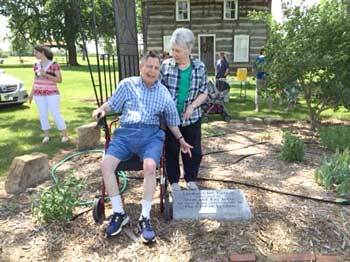 The Lyndon Community Business Women recently dedicated the flowerbed at Lyndon City Park to Steve and Kay Jones for their service and work for the city of Lyndon. Steve was a lawyer with Coffman, Jones and Gilliland for many years, retiring to become a magistrate judge for the Osage County District Court. He also served as judge for the city of Lyndon. Kay served as Lyndon city clerk; after her retirement she became a council member, and was later mayor. She was a charter member of the CBW flowerbed project committee. The couple could often be seen doing extra work to help with the flowerbed project. Information and photo thanks to Lyndon Community Business Women.